Get online payments through echecks from your attendees with the AuthorizeNet AIM eCheck payment gateway for Event Espresso. Need to Buy a Support License for Authorize.Net AIM eCheck? Download the latest version of the Authorize.Net AIM eCheck payment gateway for Event Espresso 4 from your Event Espresso account. Learn how to find the API Login ID and Transaction Key in your Authorize.net account. You can then enter your API Login ID and Transaction Key for Authorize.net in the payment methods page for Event Espresso within your WP dashboard and then click on the Update Settings button. Need to test Authorizenet AIM eCheck? Turn on debug mode from the payment methods screen and save changes. Be sure to turn it off once you are finished testing. Will Authorizenet AIM eCheck be the only payment method enabled or the only one you offer? Click here to learn how to make it selected by default during the registration checkout. An account with Authorize.Net is needed to accept payments via Authorize.Net. Note that the eCheck option is an addition to a merchant account with Authorize.net and is available to merchants within the United States. This means that it is not enabled by default and you can reach out to Authorize.net support to add the eCheck feature to your merchant account. Login to your WP-admin (WP Dashboard) and go to Event Espresso –> General Settings –> Payment Methods. Once on the Payment Methods screen, click on Authorize.net AIM eCheck and click on the button to activate the payment method. Open by Default? – This sets this payment gateway to be pre-selected on the registration checkout page. Authorize.net API Login ID – This credential is needed to process payments. Learn how to find the API Login ID in your Authorize.net account. Authorize.net Transaction Key – This credential is needed to process payments. Learn how to find the Transaction Key in your Authorize.net account. 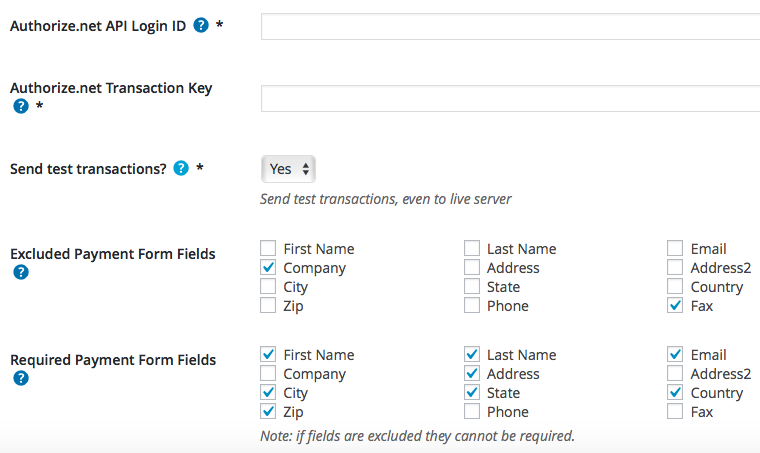 Send test transactions – Set to yes to send test transactions. This should be set to no on a production/live site. Excluded Payment Form Field – Check a field here to exclude (remove) it from the payment form. Required Payment Form Field – Check a field here to require it on the payment form. If a field is excluded through the setting above, then it will not be required. Server – Select if payment requests should be sent through Authorize.net server or the newer Akamai servers. The Authorize.net AIM eCheck payment gateway will let you accept payments via check (processed electronically) on your website. An account with Authorize.net is needed, and an SSL certificate is recommended for securing your website. I configured Authorizenet AIM eCheck and payments are not being processed. Can you help? A payment via eCheck is not instant. You will see a confirmation of a payment in Event Espresso. However, the actual funds will take a few days to transfer to your bank account. If no payments are processing, then double-check that you are using your API credentials for production (live) mode which are different than your login information for your Authorize.net account. Also, ensure that there is no extra spacing before or after the credentials in the payment methods screen of Event Espresso 4. When I refund a payment, does it also refund through Authorize.net? 2) Then login to your Authorize.net account and process the refund. How can I set up a recurring payment or subscription through Authorize.net AIM eCheck? Recurring or subscription payments are not currently supported in the Authorize.net AIM eCheck payment gateway. Is an SSL certificate needed for Authorize.net AIM eCheck? View more information on PCI compliance from Authorize.Net.